Advancements in small wire technology, injection molding processes, bristle materials, and bristle attaching techniques have assisted in the creation of a breakthrough endodontic microbrush. An appropriately sized and tapered microbrush may be utilized to optimally finish root canal preparations. The best diameter, length, stiffness and material of each bristle has been identified and the optimal configuration studied. Bristles can be attached to a flexible plastic core material and the brushes activated utilizing a rotary handpiece to optimally finish the root canal preparation. 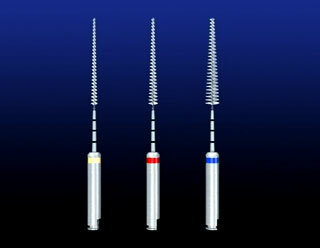 Tapered microbrushes enhance cleaning as bristles deform into the irregularities of the preparation and move debris into intracanal solutions where it can be liberated from the root canal system. Rotary activated microbrushes turn at about 300 RPM and the helical bristle pattern effectively augers residual debris out of the canal in a coronal direction. Additionally, microbrushes designed for ultrasonic use are also being analyzed and are intended to brush the walls of the preparation and activate solutions of NaOCl and 17% EDTA to produce cleaned canals. Currently, research is being conducted to ascertain the most optimal method of microbrush activation, solution or irrigation sequence which will most effectively and efficiently produce "cleaned" root canal walls with open dentinal tubules.